Our delivery area: Practically the whole Puget Sound in Washington State! Deliveries--We continue to make deliveries upon request on any day depending on availability! Sometimes we can deliver the same day but it is always good to order in advance as much as possible as we are very busy this time of the year. Please plan ahead and arrive to the store at least 30 minutes before closing. There is a $20 after-hours surcharge added to all orders loaded after 3:45 pm Mon-Sat or after 1:45 pm on Sun. We close the store promptly at 4 pm and on Sundays at 2pm respectively so that we can get to our scheduled afternoon/evening deliveries and our employees home on time. We have Happy Hour Specials, Monday - Fridays 12-3pm!! See our Happy Hour Price List and come in for EXTRA HUGE savings. Note that Happy Hour Pricing applies to picked up materials (full cubic yards) only. Delivery is not applicable. Landscapers and contractors can also enjoy special low pricing at any time by providing us a hard copy of your resale permit. Our Landscaper/Contractor Price List shows you the power of deep discounting! One other thing....we accept credit cards so swipe away with your purchases. For savings, ask about our cash discounts available any day except Sunday. We have a large delivery area, delivering in most of Snohomish, King & Pierce counties and we have great prices that our competitors HATE us for! We also deliver small and large quantities and do not have minimum orders. Whether you want 1-75 cubic yards (or more) of rock, bark, topsoil, compost or play chips or you just want a couple railroad ties thrown into your order for your project, we've got you covered. Plus, we have small, medium and large dump trucks and we would be glad to deliver it to you. We're nice people too and always looking for nice people to do business with. When you buy from a small local business like ours, you're not helping a CEO buy a third vacation home or even worse, increasing the $800 billiion trade deficit with China. You're helping a little girl get dance lessons, a boy get his team jersey, a mom and dad put food on the table, a family pay a mortgage, or a student pay for college. When you email, call us, come visit our store, or have us deliver to you, we want you to feel like you are one of our own family members, giving you extra help, the straight scoop, and quoting you a great price for our materials that you can either pick up yourself of have us deliver to you. When we deliver to you, you can trust us to be honest, professional and have the integrity that makes you want to call on us again or even better, refer us to others. Your patronage and satisfaction are very important to us. Have fun checking out our website and if you decide something looks good, we hope you....Go With Joe! Our Deliver Area = Most of Puget Sound!! We specialize in delivering landscaping materials throughout the Puget Sound area! We have storage yards that we deliver from in the north, south and eastside, so whether you are in Dupont, Tacoma, Puyallup, Auburn, Maple Valley, Bellevue, Sammamish, Bothell, Seattle, Shoreline, Mountlake Terrace, Lake Forest Park, Kenmore, Lynnwood, Everett, Marysville or another city or neighborhood in the Puget Sound area, we're never far from you. See the map above. We have a huge delivery area (the whole area inside the red line) but even go outside of the lines sometimes. Plus, we'll deliver our landscaping materials to you "on time and under budget"! If you have questions to ask us or you know the materials you want and the quantity (in cubic yards) that you need, great! Go to our Get A Quote page, fill out the form and email it back to us. We'll send you back a quote with product and delivery information right away. If you're not sure about how much you need, go to our How Much Do I Need? page for help. We deliver 7 days per week and provide price quotes and take orders by email 24/7! Check out the Location and Hours page ﻿﻿for a current list of products/materials available for pick up at our 1 and only retail yard in Woodinville. Note that we sell many products and materials that are available for delivery only (and not available for pick up at our retail yard in Woodinville). If you have a question about an item, please email us! This year, we wish you good times with your family, safe and fun family vacations and holidays, tasty barbeques, lots of treats and don't forget......beautiful (and completed) landscaping projects!! We know it can be challenging to buy American, especially with so many things that we purchase we don't even know where they've been made. Heck, I've found that it is a huge challenge to find the most basic items such as shoes or socks that aren't made in another country such as China, Vietnam, Cambodia, Taiwan etc. I even found that my new, New Balance shoes, which I thought were supposed to be American Made say "Made in Vietnam". Insert sad emoticon here!! At Joe's, the materials and products that we sell and the equipment and trucks that we use are almost exclusively American made, produced, processed, and manufactured. Our employees are American citizens too. No H1B visas here baby!! Let's do our part to reduce the 800 billion trade deficit with China and the 60 billion deficit with Mexico and just buy (and hire) American already! Just try it and be aware of your purchases. 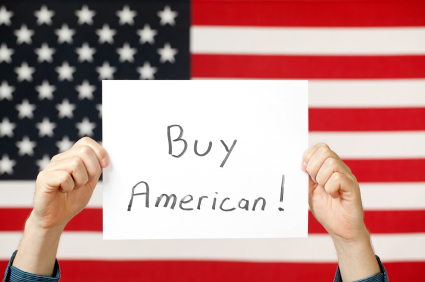 Whenever you can, make big purchases that are American made, such as furniture, appliances and vehicles. Buying American helps our communities, our neighborhoods, ﻿our local and national economy, makes the country we live in strong, and puts good people to work. We encourage you to do the same and while you're at it, invite your friends, family & neighbors over for a barbeque. ﻿Thanks! !